Boy, is it hard to get things accomplished with two little ones! 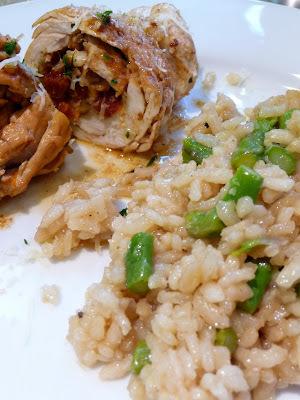 I'm finally posting the chicken recipe I blogged about a week ago. I find the stuffing keeps the chicken very moist and bursting with flavor! A trick I like to use when pounding the chicken is to lay the breasts between two sheets of parchment paper and beat them with a heavy cast-iron skillet. Be sure not too beat too thin, it can tear holes in the breasts. Enjoy! Wash and break off last 1 1/2 in of the asparagus spears. Cut into 1-1 1/2 inch pieces (tips longer, base shorter). If your asparagus is especially large, cut into smaller pieces. Bring a saucepan with a quart of water to a boil. Blanch the asparagus pieces for 2 minutes. Use a slotted spoon to remove the asparagus to an ice bath to shock the asparagus into a vibrant green color and to stop cooking. Drain the ice water and set aside. In a 3 or 4 quart saucepan, heat 3 tablespoon butter on med heat. Add the shallots and cook for a few minutes until translucent. Add the rice and cook for 2 minutes more, stirring until nicely coated. While the shallots and rice are cooking, bring the stock to a simmer in a separate saucepan. Add the wine to the shallot and rice mixture. Slowly stir, allowing the rice to absorb the wine. Once the wine is almost completely absorbed, add 1/2 cup of stock to the rice. Continue to stir until the liquid is almost completely absorbed, adding more stock in 1/2 cup increments. Stir often to prevent the rice from sticking to the bottom of the pan. Continue cooking and stirring rice, adding a little broth at a time, until the rice is tender but still slightly firm to the bite, about 15-20 minutes. Remove from heat. Gently stir in the parmesan cheese, the remaining 1 tablespoon butter, and the asparagus.